and keep dogs in their forever homes! Recognize when a dog needs to eliminate. Have a dog who goes potty when asked. Clean up accidents to prevent them in the future. Retrain mature dogs who are using the wrong bathroom. Start a puppy off on the right paw to eliminate future accidents. Inside you’ll find the importance of management, why dogs go where they go, when a puppy is most likely to need to pee, realistic expectations, and what to do about regressions. When you hear “housetraining,” you might automatically think “puppy,” but that’s not always the case. Sometimes adult dogs need a refresher course due to age, health conditions, or new environments. Strongly recommended for any owner with a new dog, whether it is a new puppy, or an adopted dog from a shelter or rescue group. For almost all dogs, following this booklet to the letter will help to ensure a clean home and happy human. Love Has No Age Limit is another good resource for dogs adopted from puppy mills or shelters who need remedial house training. 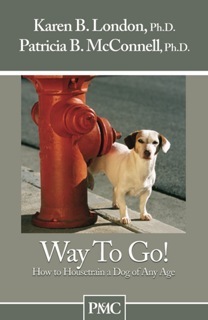 Help your clients address the most fundamental training task--housetraining, with this simple, easy to follow booklet. Accidents in the house are profoundly frustrating and disruptive to owners; veterinarians are in a perfect position to help their clients get on the right track before problems develop. We all know the first question asked about a dog: “Is he potty trained?” The answer should be “Not in a new house!” Way to Go increases the chance of a successful placement by helping new families understand that all dogs need to know where the bathroom is and gives them a blueprint to train any dog where and when to go. "Invaluable! I wish I had this when I was first training my dog!" “A common sense guide for anyone having trouble housetraining any dog of any age. perfect resource for new dog families and experienced dog owners. “…all of McConnell’s books are remarkable. This volume is no exception.